This easily transportable test rig is a "must have" piece of equipment for the evaluation of hydrocyclone applications. 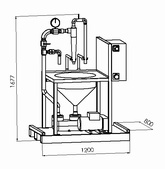 The rig is adaptable for the testing of all hydrocyclones up to and including 2". It is mounted on an EUR size base making it easily manoeuvrable. 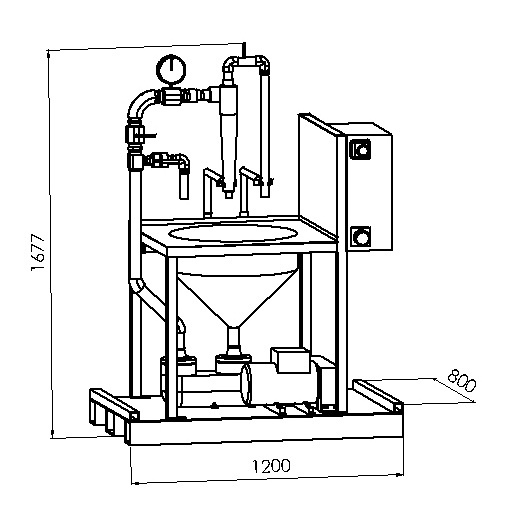 The Hydrocyclone Test Rig includes pump, sump, pipework, pressure guage, valves and motor. 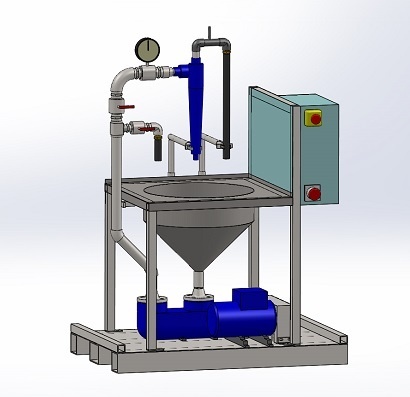 A Variable Speed Drive (VSD) is used to control the motor which in turn powers the pumps delivery of the slurry from the hopper.The flow rate can also be controlled using the valves and by-pass configuration and the pressure can be recorded from the pressure gauge. The combination of VSD and valves gives greater potential for the user to achieve the required results in the most economic and energy efficient manner. 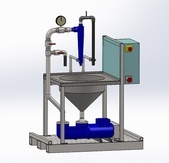 The test rig is adaptable using a simple selection of cyclone input and overflow adaptors which can be purchased on ordering the rig or at a later date. We manufacture the rigs to our clients specifications (power supply, hopper capacity, pump and motor capacity). Please contact us with your requirements for a detailed quotation.